For thousands of years the mighty Altamaha River has flowed unimpeeded through south central Georgia, ever bound for the sea. Formed by the confluence of the Ocmulgee, Oconee and Ohoopee Rivers near Lumber City, the Altamaha River watershed is the largest river system east of the Mississippi, offering priceless habitat along its 140 mile course. Georgia’s largest river and one of the most important rivers in the Southeastern United States, the Altamaha also provides some of the best outdoor recreation opportunities in Georgia. You can paddle the wide, winding river between large sandbars and beautiful oak trees near the confluence of the Ocmulgee and Oconee rivers. You can dart through side channels and sloughs of cypress swamps in the wilderness of protected forests that make up the last 60 miles of the river, or dodge shrimp boats and fisherman in the coastal marsh as you pull into historic Darien. It’s wild, beautiful and a great resource for outdoor enthusiasts looking to paddle a day, or even weeks, on the river! Its largest tributary is the Ohoopee River, which joins the Altamaha on the southern border of Tattnall County. The Altamaha River watershed forms the largest freshwater river system east of the Mississippi River. The Altamaha River is Georgia’s largest (though not longest) river. The Ohoopee River joins the Altamaha in Tattnall County. The Big Hammock Wildlife Management Area and Big Hammock Natural Area are located along the Altamaha at the Ohoopee confluence. Big Hammock Natural Area is a National Natural Landmark site, noted for its ecological biodiversity and many rare plant species, including Georgia plume. More than 100 species of rare or endangered plants and animals find shelter in this basin, including the Georgia spiny mussel, Atlantic sturgeon, the swallow-tailed kite, the American oystercatcher and the piping plover. Further inland, the watershed includes old stands of longleaf pine, colonies of the endangered red-cockaded woodpecker, gopher turtles, Alabama milkvine (Matelea alabamensis) and other rare plants. The perfect example of a true Southern river, the slow-moving waters flow effortlessly through some of the South's last remaining hardwood bottomlands, cypress swamps, historic rice fields and tidal marshes. More than 20 million years old, the Altamaha River, unhampered by dams, travels from its confluence in Wheeler County to its coastal terminus near Darien. As the second largest river basin on the Atlantic Seaboard, the Altamaha drains more than one quarter of Georgia's land surface, including half of Atlanta and all of Macon. With more than 100,000 gallons of water expelled into the Atlantic Ocean every second, the Altamaha is "Georgia's Mightiest River." 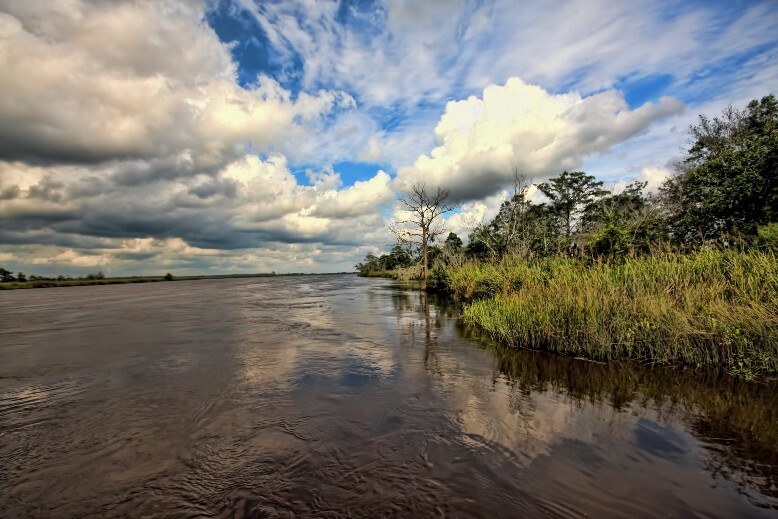 At least 125 species of rare or endangered plants and animals exist along the Altamaha River. Birds such as the bald eagle and swallow-tailed kite, soar above its banks. The shortnose sturgeon and the manatee swim through the Altamaha's lazy meanders. The gopher tortoise and the eastern indigo snake coexist among its sand ridges, and the sandbars and sloughs are home to seven species of pearly mussels that live nowhere else in the world.